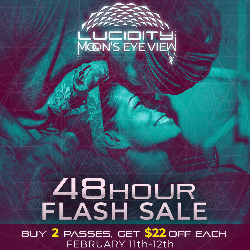 BUY 2 PASSES, GET $22 OFF EACH! After a beautiful and majestic Rising Dawn and as sun rays sweep across much of the New Earth’s surface, we step back and imagine what it must be like to be the Moon. A cool, calm presence in our orbit, Moon reminds us of the greater celestial forces that govern the tides, our emotions, and many other natural rhythms. From Moon’s unique vantage point, she sees all that transpires on our pale blue dot — all our joys and all our pain, all of our creating and all of our destruction. And how interesting that we only see one side of her, the dark side of the moon remaining ever hidden from our view, peering out into the solar system, into the galaxy, and the great unknown of outer space. She insists that we must be willing to fearlessly journey into the great unknown if we wish to share such an expanded perspective! From the Moon’s Eye View, we are invited to see our floating island for what it is — a lush and magical garden, a sanctuary of life, a place so many call home. We understand that anything that harms the great web of life, harms each of us. We take responsibility for the larger expressions of war and resource depletion and power hungry politics as macro expressions of micro processes that exist within all of us. In the face of these individual, community, and global challenges, we step back into the humble place of the witness and ask firmly, how can we be of service to Life itself and to the Giver of this Life? While last year's story revolved around Dawn's awakening, and the fiery combustion of passion, purpose, and action, this year we will get to know Rivier, and the soothing feminine attributes of emotion, flow, and the preciousness of life.